Tammy & I want to pass along our thoughts about our stay at Calycanto Casitas. This was the first time we have stayed at a place other than an all inclusive resort. The experience was amazing. The setting was exceptional, with the perfect sunrises over the mountains in the morning, and breathtaking sunsets over the Pacific at night. We really enjoyed exploring Todos Santos, whether it was shopping for food supplies, or finding that perfect souvenir to take home. The people were exceptionally friendly as well. We also enjoyed watching the humpback whales play in the ocean. At times they seemed so close to the beautiful beach, we wondered they didn’t get beached! We would definitely come back and spend more time at Calycanto, if and when the opportunity arises. Our stay at CalyCanto was more than we could have hoped for. After spending a week at an inclusive resort we were anxious to find something a little more relaxing and just unwind. CalyCanto was that and more. We arrived later in the day after a semi-stressful drive from San Hose del Cabos and by the time we unpacked and settled in the day was winding down. We had enough time to pour a glass of wine and move onto the upper patio and catch the sun as it was settling onto the horizon over the Pacific, as it disappeared in a magnificent display of colour any of the day’s stress went with it. So went the rest of our stay at CalyCanto. From the sun rising early over the mountains to the last hint of warmth as it slips down over the ocean; the tranquil walks on the beach that was so deserted we felt we had miles of our own private beach. Then there are the whales. It’s hard to describe what it is like to watch as perhaps hundreds of these giants gently glide up and break the surface, sometimes so close to shore you could almost touch them, absolutely breathtaking. The house was more than we could have hoped for down to the last detail. You have everything anyone could possibly need. The town of Todos Santos has everything from shopping to fine restaurants to some of the freindliest people we have met in our many trips to Mexico. Cecilia and Enrique are perfect hosts, willing to go that extra mile to make our stay a pleasant one. All this to say that in all our travels to Mexico, CalyCants is the one place we can honestly say we would recommend to anyone looking for a peaceful relaxing place to get away from everything and just chill! FYI, we found the most incredible golf course while on a day trip to La Paz, it put every golf course in Los Cabos to shame for a fraction of the cost! Please feel free to have anyone contact us, we would be only too happy to share our experience at your hidden gem. 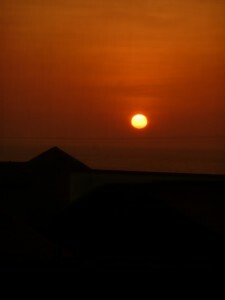 Todos Santos is an extraordinary place. Beautiful, relaxed, genuinely charming because uncontrived, there is no place like it on earth. It has been officially christened with the highest honor for historic towns in Mexico, “El Pueblo Magico”, and there’s no hyperbole in the title. It’s impossible to describe just what it is that makes this small town deep in the Baja so magical; it’s something subtle, beyond words, and all enveloping. Especially remarkable for a town this size, there’s a wonderful range of eating options: fine dining, delicious street side tacquerias, cafes, restaurants, open air markets. . . .you can find anything to fit any circumstance or budget and, like the various aspects of the town itself, they all blend together into an intimate and seamless whole. The CalyCanto Casitas are the ideal place to experience this idyllic setting. It doesn’t feel like you’re in a vacation rental, even though there are some very nice ones available; it feels like you’re being hosted in someone’s beloved home, and you are. The owners’ great love and respect for the region is everywhere apparent: in the beautifully simple, strong furniture Mexico is famous for, in the equally and deservedly famous saltillo and talavera tiles that serve as the flooring both inside and outside, in the abundance of architectural details, the rich colors, in the charm of the bathroom and the outdoor shower overlooking the ocean, in the outside wood shutters on every window, including the sliding glass door leading onto the terrace, for maximum comfort and control. Cozy inside, expansive outside, I alternate between sleeping in a big soft queen bed in the beautiful bedroom or out on the roomy terrace under the stars. The nighttime sky itself is a marvel; without the compromise of city lighting the heavens are brilliantly alive. . . .You can almost always hear the surf, night and day, and many a night i’ve made my way in the moonlight the short distance to the sea. Jim, one of the owners, is wonderful to deal with. From the very beginning of our acquaintance, it was clear there was an unusually open and friendly person on the other end of the email. Throughout all my dealings with him to get the various details worked out, as I am a long-term tenant (something I highly recommend), he has consistently treated me as a friend. He is as special as the town and the casitas are. Enrique and Cecilia,the on-site property managers, are both graduates in graphic design from the University of Guadalajara. They create the local maps and run a small collectibles store in town. Fluent in English and exceptionally attractive and sweet young people, if you need anything, they are there. Everyone’s interest is ensuring you take in everything Todos has to offer. The casitas themselves are perfectly located about 2 and 1/2 miles from the town proper. I love being in Todos Santos with all it’s gently bubbling life, and I love being outside of it in the deep silence and peace of the country. Getting into town is a 5 minute or so car ride. I highly recommend hitchhiking; I’m seldom on the road more than 5 minutes before a car comes along and through this method I’ve come to know many of the locals, as well as the large community of passionately devoted outsiders. . . . English, Portuguese, Italian, American, Mexicans from other parts of the country, particularly Mexico City. . . . Many of the people I’ve met in this way have become friends. Or you can call Octavio, one of the two or three taxi drivers in town, and he’ll come and get you. I prefer to walk home as the sun is setting, and just take my time wending my way up El Camino a las Playitas, drinking it all in: the palms, the tiny tiendas, the beautiful homes scattered here and there, the first appearance of the moon, and the sea, always the sea, in the distance. To be here in Todos Santos is to live largely outside of time, to live largely inside the abudance of nature, and to dwell with people, indigenous or coming from elsewhere, that are happy, that are open, and with whom one feels an effortless sense of easy community. It has been fantastic to be here in the “off season:” It is hot but not as hot as many American cities, and considerably less than some. Between the ocean breezes and the whirling of the giant palapa fan above the bed, I’ve never been hot or uncomfortable. Like everything else here, the heat feels good, feels right, feels like living well. CalyCanto Casitas are every bit what has been written about them! There is no question that the amazing beaches the weather, the proximity to Todos Santos and many great restaurants, fresh fruit and vegie markets, some of the friendliest people in the world and lots of peace and quiet are what makes this such a unique vacation destination! I would however like to give you a unique perspective on both Todos Santos and CalyCanto! At 64 years of age and from Canada originally, I have been retired for almost 20 years and have lived in over 60 countries over these last 20 years! From Africa, to Asia, the US, the Caribbean Hawaii several times, Australia and New Zealand and many years in numerous countries in Europe! I have rented more properties around the globe than most people could ever imagine (every month and every year for almost 20 years as I have no primary residence anywhere on this planet)! Given this rather unique perspective, I can say without hesitation that our last four months at CalyCanto have rivaled anywhere else I have stayed in the world!! If there is anyone qualified to make such a statement, I feel I am! While there is so much already said about CalCanto and Todos Santos on other posts, one can only appreciate just how good this place is by being here! We have all been disappointed numerous times by being fooled by all the pretty pictures and wonderful accolades about a property! NOT this time. CanyCanto is everything that is said about it and then some! 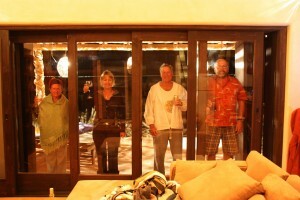 So much so that we are returning to CalyCanto for the winter and are planning to make Todos Santos home in 2011! If you truly wish to experience everything you read about Todos Santos and CalyCanto , then I highly recommend you come and see it for yourself The management and US ownership guarantees that added peace of mind that one comes to expect from a property of this quality! 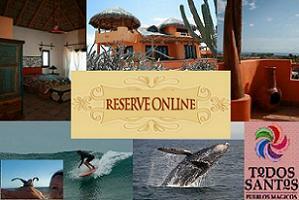 The CalyCanto Casitas are a perfect, affordable, tranquil place to spend some time relaxing in southern Baja. Ideally situated for surfers and non-surfers alike about two miles from the break at La Pastora and about the same distance to the town of Todos Santos, CalyCanto is an unusual find in Baja. The ammenities and attention to detail are first rate, with luxuriously appointed modern comforts. The site managers Enrique and Cecilia are very hands off, but friendly, helpful people, who are available whenever you need them. Jim, one of the owners, is similarly an easy-going guy who was a pleasure to work with. I went down with a couple of surf buddies, and it was certainly the nicest accommodations we’ve had for a surf trip! 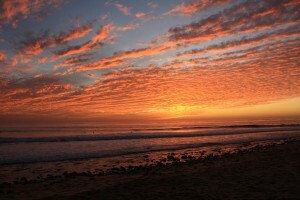 I definitely plan to return, either on another surf adventure, with the family, or as a romantic getaway with the wife. What a wonderful place! CalyCanto is the perfect getaway – there are not many places where you can escape to a place so tranquil. We spent our nights sipping cocktails and watching the sun set under the second floor palapa, our days lying on the endless beach across the road from the property, whale watching, and my husband took advantage of the great surf at La Pastora – just a few minutes away. We loved the outdoor shower off the master bedroom — open enough to see the beach/sunset views yet completely private. The kitchen and living room area is spacious and open which made for a great room to entertain and cook all at once (we even had a local come in and cook for us one night). The town of Todos Santos is so charming and just close enough to CalyCanto that it’s easy to get groceries, check out the art galleries, shop, etc. We also enjoyed several wonderful restaurants in town. I would highly recommend CalyCanto for the traveler that wants a relaxing trip with great weather, amazing beaches and beautiful views. 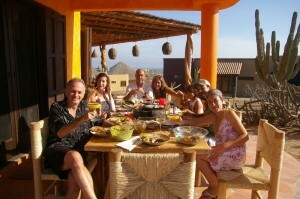 We frequent the Todos Santos area every year and on our most recent trip in December we stayed at the Calycanto property. Attention to detail is the first thing that came to my mind when I walked in the door. We had 4 adults and 2 teenagers and we couldn’t have been more comfortable. The upstairs bedroom has an attached bath with a magnificant outdoor shower leading to a small balcony. 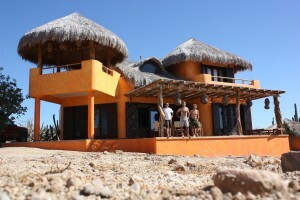 Also upstairs is the outside palapa where we watched the famous Todos Santos sunsets. The downstairs bedroom also has an attached bathroom and a great Palo de Arco covered patio for relaxing or reading a book. The open kitchen is small but has all the necessary appliances. Nothing has been overlooked in the design of Calycanto. We can’t wait till our next visit!! The attention to detail in the CalyCanto Casitas is remarkable. The saltillo and Talavera tiles are simply gorgeous. 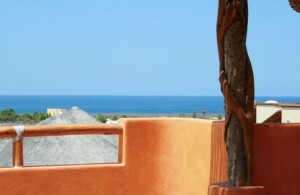 With ample ocean, mountain and desert views the casitas offer the best of Baja Sur – luxurious accomodations just minutes from the center of the magical pueblo of Todos Santos. We stayed three nights. Although our villa was still being completed, we were more than comfortable. The pillow-top mattresses are a rarity in Mexico as are showers with solid water pressure such as those in the villla. The nearby surf break provided consistent overhead waves and warm water. The sunsets were all time. The onsite managers, Enrique and Cecilia, were extremely friendly and accomodating. When complete, CalyCanto Casitas will no doubt stand as one of the finest propoerties in the region. I look forward to returning soon! About an hour drive north of Cabo San Lucas, through the cozy town of Todos Santos, and down a long dirt road towards the beach, these casitas are about as removed from the hustle and bustle of our daily lives as you can get. Yet with high-speed internet access, you can still tend to things back home if you need to. Each casita is equipped with everything you need. A fully stocked kitchen with center island, large comfortable couches in the living room, beautiful authentic furniture throughout, and two bedrooms suites – one up and one down – for complete privacy. The upstairs bedroom not only has it’s own balcony, but also a private outdoor shower to wash the sea salt off as you bathe in the warm rays of the afternoon sun. There’s also a covered roof top deck, soon to be complete with hammocks: perfect for sippin’ margaritas while watching the sun slowly set over the Pacific ocean. If you’re looking for a place to forget it all, look no further. The CalyCantos Casitas are it. Like me, you’ll wish you never had to leave. CalyCanto is comprised of 3 beautiful homes with sweeping views of the Pacific Ocean. The area is safe, quiet and provides an opportunity to “check-out”. Each home is fully furnished with old word Mexico taste and charm. Each includes a fully stocked / full size kitchen, high-speed wireless internet, gorgeous bedrooms with amazing comfy beds and views and fantastic outdoor living spaces. Each house is custom built and I was blown away with the attention to detail including authentic talavera and sautillo tiles throughout. The master bedroom on the 2nd floor has an outdoor shower looking over the pacific. Each casita has EVERYTHING YOU NEED to enjoy a comfortable and memorable stay. Sit outside in your own private second story palapa deck and watch spectacular afternoon sunsets or stargaze to the sound of the surf and coyotes howling at night. Walk along empty beaches for miles and miles and witness pods of Whales breaching and spouting so close to shore you can hear them! Enjoy wonderfully diverse cuisine in town or cook your own fresh caught fish in a wonderfully appointed kitchen, and enjoy outdoors on your own covered private patio. If you are seeking outdoor adventure, you’ll have easy access to world class fishing, diving, and surfing. The water was 80 degrees! There are also amazing hiking trails, eco-adventures and wildlife excursions. The casitas are located just north of Todos Santos down a easy to drive dirt road. You truly feel like you are in the baja of old with beautiful empty beaches, and cactus fields as far as the eye can see.